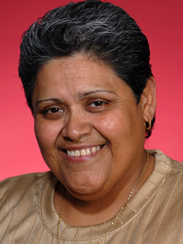 Amador and partner Norma Seledon support a range of Latina lesbian and other causes, including Amigas Latinas. Alicia is a life long resident of Chicago’s Pilsen Little Village community. Alicia has been employed at Mujeres Latinas en Acci�"n for 29 years. During her employment at Mujeres, she has held several positions, such as Interim Director, Domestic Violence counselor, youth employment specialist, youth outreach worker, Teen reach supervisor and house parent for teen runaway girls. As community organizer, Alicia has dedicated her life to working with youth in the lower west side area. Currently Alicia holds a position of coordinating the youth service programs at Mujeres Latinas en Acci�"n. Part of those programs are working with an after school program called the Peace program for children between the ages of six through twelve. The children are taught how to resolve their problems in a constructive manner. The group also brings in their homework and we keep track of their report cards by meeting with each child’s teacher.